Sundays and Beyond is Saint Mark's weekly email newsletter, which provides general information about what's happening and how you can be a part of it. We also send letters from the cathedral and special announcements to this list. In addition to this general interest newsletter, Saint Mark's sends other emails for specific areas of interest and ministry. Children and Families: Weekly newsletter with thoughts about formation in families as well as information about upcoming activities tailored for, or of interest to families with young children. Youth: Similar to the Children and Families newsletter, but for youth in middle and high school. Arts and Concerts: To receive email reminders about concerts and art exhibits at the Cathedral. Justice and Social Action: Periodic updates which offer opportunities to participate in social justice and meaningful presence in the Seattle community. Mideast Focus Ministry: To learn about programs and activities sponsored by the Mideast Focus Ministry, a Justice Ministry at Saint Mark's. 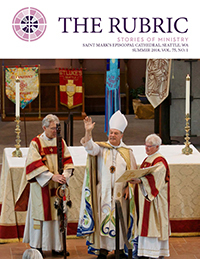 The Rubric: Recieve a digital version of Saint Mark's quarterly magazine, which tells stories from the Cathedral and the Diocese of Olympia. Not receiving e-mail for your subscription? If so, perhaps your email software is diverting your subscription e-mails to your spam, junk, or bulk folder. To prevent this from happening, be sure to include "info@saintmarks.org" in the address list of the email software you use. For further questions, please contact info@saintmarks.org. The Diocese of Olympia sends a weekly email newsletter with announcements about events and opportunities throughout the diocese. Subscribe here. In addition to being offered via email, Saint Mark's weekly newsletter comes in print. The print version is part of the weekly service bulletin you receive in church. To print a copy of a recent issue, visit this page. The Rubric: Saint Mark's quarterly magazine tells stories from the Cathedral and the Diocese of Olympia and the wider church. View recent issues below. The Rubric is a publication of Saint Mark's Cathedral that looks at who we are as a community: as a parish, as a cathedral for the Diocese of Olympia, as Episcopalians, and as Christians. Articles showcase members, volunteers, programs and ways we help transform this community and the world. Most articles are requested by the editor or other Cathedral leadership. To submit a story idea, please contact editor Liz Bartenstein. The Rubric is available on this website, and in print in the Cathedral Nave. To receive a copy by mail, call 206.323.0300 or email info@saintmarks.org. Download the latest issues below.